HPE has gobbled BlueData, purveyor of the EPIC Big Data-as-a-service software that can run large-scale distributed analytics and machine learning workloads in Docker containers. The business was founded in 2012 by CEO Kumar Sreekanti and chief architect Tom Phelan, and has taken in just $39m in funding. There have been three rounds; a $4m A-round in 2013, a fast $15m B-round from an Ignition Partners-led group in later 2013 and a $20m investment led by Intel Capital in 2015, with Dell Technologies Capital participation. Blue Data announced general availability of its wares on the Google Cloud Platform and Microsoft Azure in September. 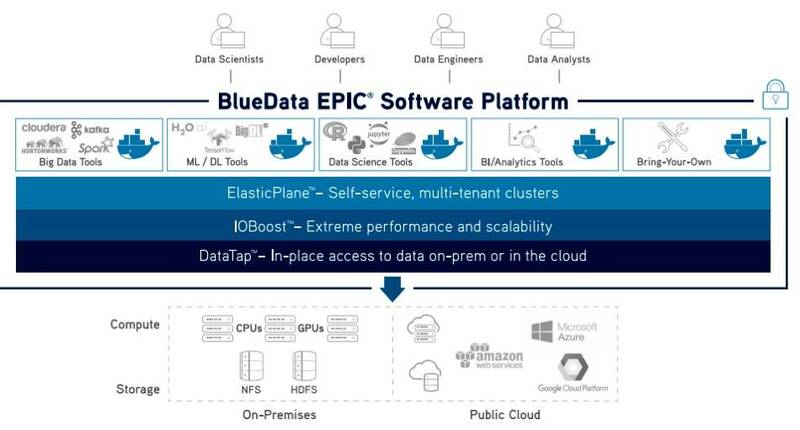 The strategy is to develop EPIC to support punters' Big Data and AI initiatives, via AI-as-a-Service and ML-as-a-Service, either on-premises, in multiple public clouds or in a hybrid cloud environment. It provides on-demand provisioning for Cloudera, Hortonworks, MapR, Spark, Kafka, TensorFlow, H2O, and other tools for AI/ML and Big Data. BlueData said it delivers bare-metal performance for containerized AI/ML and Big Data applications, and optimization for both Intel Xeon servers and Nvidia GPUs. In a blog Sreekanti talked up the "impact" the buy will have on the overall AI, Machine Learning, and Big Data Analytics market. "What's changed in the past few years is that enterprise priorities have evolved from Big Data deployments (with data frameworks like Hadoop, Spark, and Kafka) to more AI-focused initiatives (with a wide range of Machine Learning, Deep Learning, and Data Science tools)," Sreekanti said. "At the same time, hybrid IT and multi-cloud strategies have become the norm. And containers are no longer new in the enterprise. Now containers are the standard, and technologies like Kubernetes have established a rapidly maturing open source container ecosystem." HPE's Apollo servers are the target hardware.